Southend missed out on automatic promotion after losing at Morecambe on the final day and seeing nearest rivals Bury win at Tranmere. Jack Redshaw fired the hosts ahead from six yards but Jack Payne levelled from inside the box soon after. Aaron Wildig then put Morecambe back in front when his shot from inside the area trickled over the line. 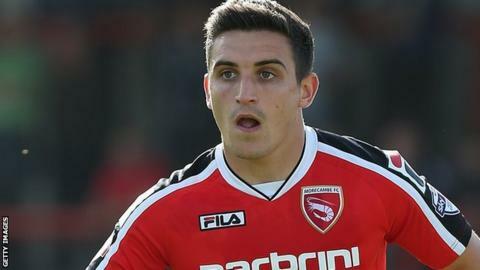 And Jamie Devitt then struck a third to leave Southend facing Stevenage in the League Two play-off semi-finals. At half-time it looked like Phil Brown's side would secure their place in League One next season, but that all changed when Tom Soares put Bury ahead at Tranmere. The Shakers held on to beat Southend to third place by one point. Match ends, Morecambe 3, Southend United 1. Second Half ends, Morecambe 3, Southend United 1. Corner, Southend United. Conceded by Andreas Arestidou. Corner, Southend United. Conceded by Andy Parrish. Attempt saved. Barry Corr (Southend United) right footed shot from outside the box is saved in the centre of the goal. Substitution, Morecambe. Aaron McGowan replaces Jack Redshaw. Attempt missed. Paul Mullin (Morecambe) right footed shot from outside the box is close, but misses to the right. Attempt blocked. Kevan Hurst (Southend United) right footed shot from outside the box is blocked. Attempt missed. Joe Pigott (Southend United) right footed shot from the left side of the box is close, but misses to the right. Attempt missed. Kevin Ellison (Morecambe) header from the centre of the box misses to the right. Substitution, Southend United. Joe Pigott replaces Ben Coker. Attempt missed. Barry Corr (Southend United) header from the centre of the box is too high. Substitution, Morecambe. Stewart Drummond replaces Andrew Fleming. Goal! Morecambe 3, Southend United 1. Jamie Devitt (Morecambe) right footed shot from the centre of the box to the bottom left corner. Assisted by Jack Redshaw. Attempt blocked. Kevan Hurst (Southend United) left footed shot from the centre of the box is blocked. Attempt saved. Jack Payne (Southend United) left footed shot from the left side of the box is saved in the bottom right corner. Substitution, Southend United. John White replaces Gary Deegan. Kevan Hurst (Southend United) wins a free kick in the attacking half. Attempt blocked. David Worrall (Southend United) right footed shot from outside the box is blocked. Kevin Ellison (Morecambe) hits the bar with a header from the centre of the box. Goal! Morecambe 2, Southend United 1. Aaron Wildig (Morecambe) right footed shot from the left side of the six yard box to the bottom left corner. Attempt missed. Jamie Devitt (Morecambe) right footed shot from outside the box misses to the left.